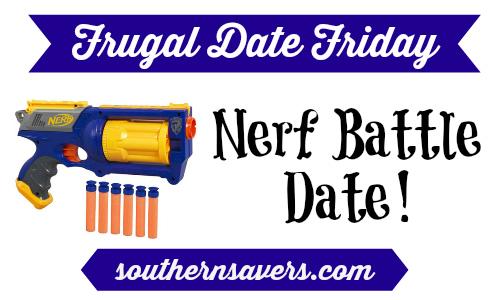 Home > Frugal Living > Frugal Dates > Frugal Date Friday: Nerf Battle! Frugal Date Friday: Nerf Battle! When life gets busy, it can be easy to forget to just have fun together. For Frugal Date Friday we are having a Nerf War. Once you have your battle plan, you are going to need some equipment. If you do not already have Nerf guns, you can borrow them or grab two for around $20. After the battle, pop in an action movie!